I have a fun project planned for us later in the week … crochet edged tea towels (posted now here)! So fun! But before we get to that, there is a first step that I think deserves a tutorial of its own … the blanket stitch. 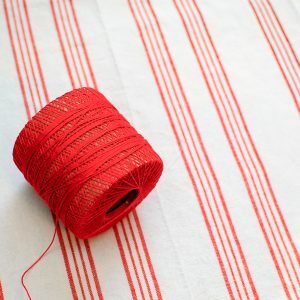 In this post, I am going to show you how to do a blanket stitch so that you are all set to trim those towels or anything else you would like to add a pretty crochet edging to! To start, you will need the fabric that you want to edge, a sewing needle, and some crochet thread. Now you can definitely eye ball your stitches but if you prefer, you can also use a water erasable marking pen to mark at even intervals along your edge; every ¼-in. is a good spacing. To set up to, thread your needle and knot the end of your thread. I try to go in through a side opening of the hem to hide my knot, but if that isn’t an option on your fabric, start from the back side of your piece. Bring the needle through your first mark, go over the top edge of the fabric and bring the needle back through the same hole again. You will now have a vertical stitch spanning both sides of your edge. Now bring your needle diagonally through that vertical bar; this places your thread along the top. Now you are in the starting position to start blanket stitching across. Insert your needle into the next mark but before pulling the thread tight, insert your needle up through the loop that is created. Now insert your needle into the next mark and again insert your needle through the loop and then pull your thread tight. Continue this across. When you have reached the end of your piece, take your thread back over the last loop and bring your needle back through the same hole. Then, knot the thread and weave the long tail into the hem to hide it. That’s it? How did you do? If you have any questions or if anything is unclear, feel free to ask in the comments below and I will be happy to try to help. 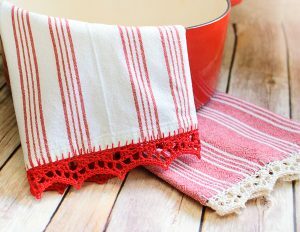 Click here for the pattern and tutorial for these pretty crochet edged tea towels! I have a useful hint that I use for my counted cross stitch pictures that eliminates the knots. Cut the thread twice the length you want. Then fold in half. Thread the loose ends through the needle. Come thru the back and then going over the top pass the needle through the loop made by the end of the thread. Pull taunt and continue on. No knots to hide!!! Awesome tip!! I do that too for embroidery but never thought to do it for crochet too! Would this also work if I wanted to do a crochet topper? What if the edges add up to a lot of length? How do you tie off the stitches and add more thread? Thanks for the demonstration. I have just purchased a skip stitch blade and attempted to use it on a hand towel (so pleased I had one for just practising on) but am having trouble keeping the line straight. Might give the blanket stitch a go instead. Can’t wait to see your towels ! I have always wanted to try this ! Kara, this is very useful. Thank you for a great post. I’ll be using this for sure! Thank you for this! Now I need to go to town!